Last month, we featured 17 must-see April football matches, all of importance in regards to very tight domestic league competitions in England, Germany and Italy, and the Champions League. In Germany, the April 11 Bayern v. Dortmund clash of the Bundesliga Titans and resulting BVB victory, sealed the championship for the ‘Westphalians’. Borrusia’s unbeaten run (currently at 27) included consecutive wins against 2nd, 3rd and 4th placed teams to clinch the repeat Bundesliga crown. In the English Premier League, it was the ‘worst of times, it was the best of times’ for Manchester City as their April 8th match-up with Arsenal ended in an ugly 0:1 defeat and the near end to their domestic championship hopes — rival Man U was 8 points ahead in the table. Fast forward to earlier this week and City’s thrilling home victory against United putting them atop of the table on goal differential. All eyes will be on City this weekend as they face 5th place Newcastle in their second to last encounter of the year. While the English and Italian domestic titles are still up in the air, Spain just today crowned Real Madrid its 2011/12 La Liga champion for the first time since 2007/08. The decisive victory came April 21st vs. arch-enemy Barcelona breaking a four-year unbeaten streak. Barca’s dip in form culminated in a 2 match losing streak, a loss in the Champions League semis to FC Chelsea, and the resignation of iconic Barca manager Pep Guardiola. Speaking of the Champions League, the two away-legs of the semis featuring Chelsea at Barcelona and Bayern at Real Madrid produced some of the most dramatic and memorable moments in CL history. While 10-man Chelsea defended to the death against a dominant Barcelona team culminating in a 90th minute decisive break-away goal by Chelsea underachiever Fernando Torres, the confident Bavarians clinched their second CL final appearance in three years in a wild penalty shootout win versus favored Real. FA Cup Final, Wembley Stadium, Chelsea vs. Liverpool, May 5th: Both sides have had rather strange, yet fairly fruitful campaigns. While both have under performed domestically, Liverpool has already secured one trophy (Carlin Cup) and Chelsea is still in the running for a FA Cup/Champions League double. If momentum were the deciding factor, the nod would have to go to Chelsea. EPL, Newcastle vs. Manchester City, May 6: Newcastle will try to secure a Cl-spot for next season and would like to spoil City’s attempt at domestic championship glory. Serie A, Inter Milan vs. AC Milan, May 6: AC Milan is currently in 2nd place in the Serie A table, one point behind undefeated Juventus Turin. Inter has yet again underachieved and will try to spoil their rival’s title hopes and secure themselves a Europa league spot by winning this local derby. EPL, Blackburn vs. Wigan, May 7: We picked this one because of its importance in the EPL relegation fight. Blackburn is a surefire relegation candidate if they lose this one on. EPL, Liverpool vs. Chelsea, May 8: Three days after squaring off in the FA Cup final, the two meet yet again, this time more for pride and final table placement than anything else. Europa League Final, Arena Nationala, Bucharest, May 9th: The 2012 UEFA Europa League Final will oppose two Spanish sides – Atlético Madrid and Athletic Bilbao with Madrid having last won the cup in 2010. 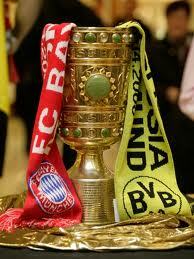 German Cup (DFB Pokal) Final, Olympia Stadion, Berlin, May 12th: FC Bayern vs. Borussia Dortmund, ‘Clash of the German Titans, part three’. 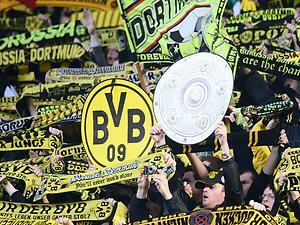 Dortmund has not lost a match in 26 tries and has beaten Bayern in its last four tries. Bayern is trying to rebound from a disappointing domestic season, but use it’s Champions League momentum to shoot for part 1 of the part 2 trophy double. Champions league final, Allianz Arena, Munich, Bayern Munich vs. Chelsea FC, May 19th: Bayern is the first CL finalist to play in front of a home crowd so the ’12th man’ definitely favors the Germans to with the crown. Both Bayern and Chelsea could be viewing for double championships – both are also in the finals of the domestic cup competitions. nPower Championship Play-off Final, Wembley Stadium, May 19th: As of May 2nd, the final match-up was still undetermined but a 2 game play-off between Cardiff City v. West Ham United and Blackpool v. Birmingham City will determine the May 19th finalist. Wembley Stadium, the site of last year’s Champions League Final will once again host the final match which determines who earns promotion to the English Premier League. Last year, Welsh side Swansea City defeated Reading to win its first ever promotion to the EPL. Coppa Italia, Stadio Olimpico, Rome, Juventus vs. Napoli, May 20th: The 2012 Coppa Italia Final will be the final match of the 64th Italian domestic cup season of the top cup competition in Italian football. 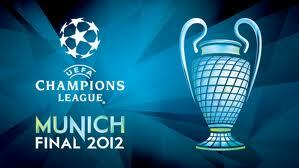 The match features Juventus and Napoli both of which are having very succesful seasons. Juventus, which as of May 2nd had not lost a match in Serie A competition, may be able to complete the Coppa/Serie A trophy double with a victory.